Green burials often utilize a biodegradable casket like this one made of wicker. Planning a funeral is never easy. It usually involves selecting a funeral home, casket and burial site. Many of us put off the planning until it is absolutely necessary. Now, some families are looking for an alternative that may feel more personal and cause less strain on the environment. 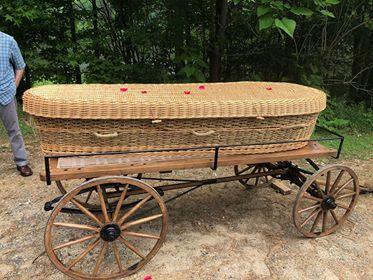 Nearly 54 percent of Americans are considering a green burial, and 72 percent of cemeteries are reporting an increased demand, according to a survey by the National Funeral Directors Association. 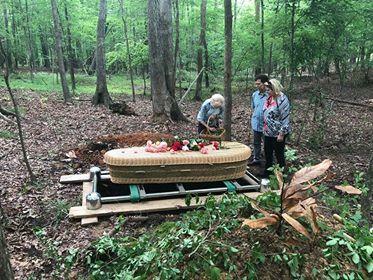 Locally, Heritage Acres Memorial Sanctuary is working to be the first in the Cincinnati area fully dedicated to natural burial. So-called "green burials" typically do not involve embalming the body and biodegradable materials take the place of a wooden casket. Additionally, families may consider other preparations at home, which extend beyond hospice to what is called "home death care." This may include a funeral or wake in the home, and even preparation of the body. Recently, Heritage Acres Memorial Sanctuary held a screening of the documentary "In the Parlor: The Final Goodbye," which examines the home death care movement. Joining "Cincinnati Edition" to discuss green burial are Heritage Acres Memorial Sanctuary President Bill Gupton; Board Member and Duel-Certified Thanatologist Cole Imperi; trained death midwife and home funeral guide Mary Manera; and with Lemasters Consulting, Funeral Director, Embalmer and Attorney Poul LeMasters. Tune in to "Cincinnati Edition" June 6 starting at 1 p.m. to hear this segment.